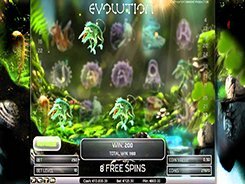 Evolution is a visually rich slot that will take you back to prehistoric times when early forms of life appeared on Earth and began to evolve from simple organisms to more complex animals. 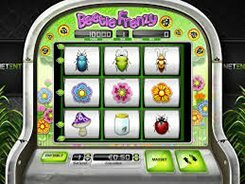 The slot is played over 5 reels and 25 fixed lines, and the reels spin from the bottom up the screen, unlike most other slots. The symbols set includes playing card symbols from 10 to Ace depicted as viruses, jellyfish or other primitive life forms. Among mid- and high-paying symbols are bizarre creatures with strange names such as Bestia Dentum (an animal looking like a whale-crocodile hybrid), etc. A bet comes in a range from $0.25 to $125 per spin, and the largest cash prize you can win in the game is $12,500; this is awarded for hitting 5 scatters anywhere in view. 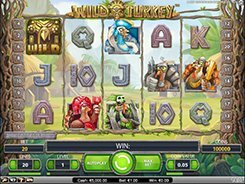 Besides, three or more scatters award 10 to 20 free spins with the Evolution feature. 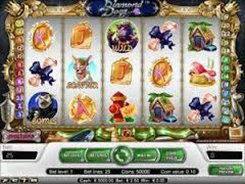 During the free spins any symbols that form a winning combo and all identical icons on the reels will evolve to higher-value symbols, so any winning combo will pay out more in each subsequent free spin. 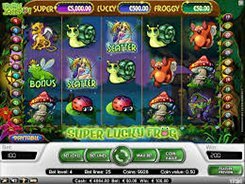 All in all, Evolution is one of the most impressive games from NetEnt, and is a must-play for all slot fans.